Speed at the point-of-sale is critical to any bar’s success. When it comes to speed, we exceed the limit. Digital Dining’s bar “speed screen” displays an unlimited number of top sellers, the items which typically account for over 80% of sales. “Fast-Cash” sales couldn’t be quicker: Tap the drink items, the Cash button, and you’re done. Opening new tabs is just as simple: Tap the drink items, then the New Tab button, and the POS automatically creates a tab number. You can manually enter a customer’s name with a new tab. Later, when searching for a customer’s tab, you can sort open tabs with customer names by alphabetical order! With “Bar Font” turned on, the bar screen displays the final total automatically in a large font across the screen, which enables the manager or video cameras to see what transactions are being completed and for how much. Digital Dining can also be set to prevent printing duplicate checks, to prevent bartenders from “making babies” out of the transactions. Transfers, reprints after changes, split checks, and every other creative function can be controlled by fingerprint, preventing a majority of the opportunities that bartenders can take “advantage” of. The POS can display and print drink recipes, which can help inexperienced bartenders prepare uncommonly ordered drinks. This also makes a great PR tool for customers who request recipes for popular drinks or house specialties. 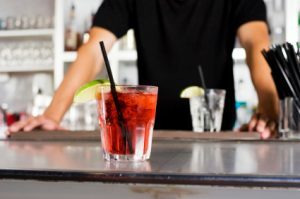 More importantly, bar managers can ensure that drinks are always made by bartenders in a consistent and uniform manner, with amounts and ingredients matching up to how the drink menu was originally costed. Incoming bartender’s can pick up one or all open tabs from an outgoing bartender with a single touch. A bartender can easily transfer one or more bar tabs to a server. The POS replaces a traditional “punch clock” with the ability to track labour hours at the POS. Digital Dining can manage various labour rates depending on the staff member and the job they will be performing. Based on the department selected, the POS assigns the correct labor rate for labor cost analysis and configures the correct features and security. Managers can also set the POS to manage break schedules in departments and edit any clock in errors. Interfaces with a variety of third party products are available so that restaurant and bar operators can continue to use the management tools they’ve grown accustomed to, while capitalizing on the power and speed of Digital Dining. Liquor and beer inventory systems, labour management, digital video recorders, cloud based “top down” reporting systems, accounting and dozens of other interfaces already exist to the industry’s most popular products for restaurant. 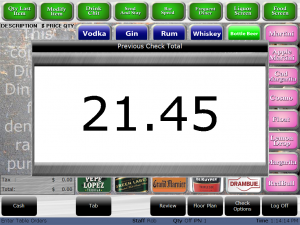 Use the Reorder button on the POS screen to reorder whole rounds of drinks to specific seat positions in the bar. With a single tap, the Reorder button allows you to order the correct drinks (with their modifiers) as often as necessary. Bartenders who have particular customers all have stories about complicated drinks with crazy ingredients. Don’t want to have to re-enter the prickly pear, okra, honey cocktail infused with saffron, strawberry and dragonfruit again? Have no fear. Touch the item and press Repeat and you’ve conquered that bad boy. Your bartenders may be a little shaken, but not stirred. 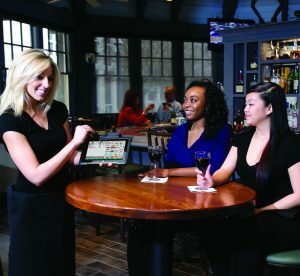 Digital Dining’s wireless handheld POS for bars and nightclubs enables bartenders to receive and send orders without moving from the service area or running to and from a stationary terminal. Equipped with belt-printers bartenders are completely independent to provide all aspects of bar service, from crowded cocktailing, event management, table service, and more. Digital Dining mobile POS works on any platform, including Windows, Apple iOS, and Android! Digital Dining makes mobile POS look easy. Integrated credit and debit streamlines transactions making them more efficient, prevents key-entry errors, can reduce payment fraud, and practically eliminates the time to reconcile electronic payments. Armagh POS Solutions has multiple Canadian processors available that provide integrated pay-at-table. Servers can recall checks and accept credit cards for partial payments, split a check between multiple customers, and all wirelessly at bar-side. Is your operation more over-the-counter than table-side? No problem. We have a variety of integrated credit card processor options that can provide a tethered solution as well. Because you’re using Digital Dining, you have access to Digital Dining’s powerful suite of graphical table management tools. Pubs and bars that have a table service component to their business won’t have to sacrifice speed at the bar for management in the restaurant if they’re using Digital Dining! Need to stay connected to your bar or nightclub 24/7? Digital Dining’s optional mobile reporting app is what you need! Download our app from the Apple Store or from Google Play and connect to your restaurant’s data stored in the cloud whenever you need information. Improve your mobile control by assigning a variety of reporting criteria and receive automatic alerts for key metrics such as the total # of checks, tables, sales, voids, refunds, and more. On or offsite, with Digital Dining, you’ll never miss a beat again!